Japan is home to a large automobile industry and most of the japanese makes have been involved in WRC with large proportion of them having also tasted success. Toyota, Mitsubishi and Subaru are the big winners with Mazda, Datsun/Nissan and Suzuki as latest having or having had active involvement. Of major companies only Honda is an exception, being more of a racing oriented. Japan and Germany, two new rounds in the WRC, have a lot in common. Both are home to major car manufacturers and are big automobile markets but curiously neither had hosted an WRC event until fairly recently. Yet, despite industrial activity Japan has not produced world-class rally drivers. That doesn't mean that there would not be interest towards rallying, quite the contrary. Outside Europe, it is quite likely that only argentinians have as much passion and interest towards WRC as japanese do. Rally Japan is hosted in Hokkaido, the northernmost of Japan's major islands. Originally it was based in Obihiro but in 2008 moved 150 kilometers west to larger city of Sapporo. Scenery is striking but pointedly very un-oriental. Sakura, the cherry flower that Japan is known for, is nowhere to be seen but vegetation, especially undergrowth, is very lush. Roads are very narrow, lined with deep ditches that often are deceptively covered by the vegetation. 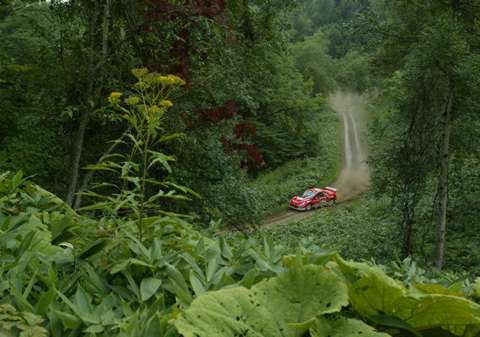 Stages have hard base covered by a loose gravel, at places quite soft with ruts forming even on first run and posing considerable difficulty in repeated stages. Even if it would not be outright rainy, weather is often wet making stages turn muddy and slippery. On top of that, fog makes occasional appearance. There also are numerous narrow bridges which, being of steel and concrete construction, allow no room for errors. Problems lurk in road sections too. Stages are quite a long way from service park, making road sections relatively long and at times very tightly timed due to low speed limits in Japan. Roads are generally quite narrow with deep ditches, making precise driving essential. Japanese fans are very international, cheering to all drivers regardless of their nationality. If Sakura are nowhere to be seen, oriental pagodas are aplenty.